PS. I am very interested in hearing that did the IAT tool auto-detection logic worked with your game. It it does not, it's easy to determine the right IAT and it's size from the output. I will try to post a tutorial for that on the official site ASAP. This is great man, 1 thing to add in a future update though, Freeze value`s like you can in CE. To get the current and updated version of the software. You must register an account and order the software via system. All this is free of charge. Most people are not going to go for this and ignore your tool if you gate it behind a registration like this. Just a heads up for future versions of your tool. Other thing would also be that a lot of people are going to be weary/untrusting of it since you obfuscated it along with anti-virus' triggering it automatically due to the obfuscation. Cheat Engine is open source and easily obtained, so you are going to want to rethink some of those choices perhaps. second is you might need to add double floating point reading and searching. both 8 byte and double take the same size in memory, 8 byte is an int type while double is float. I will think about that. The point with that was so they receive an email notification upon an update with release notes but I guess "Check for update" in the about menu does the job as well. The file is 100% clean as all of my files. Feel free to debug. What comes to CE source. I barely can read it. I mean I can read like 1% of what the code does. I never coded with Pascal. That being said, I haven't seen lately that many CE's being released despite the source code. What I exactly refer to, a port that can be taken seriously. If an AV trigger obfuscated .NET exe as a virus whatever whilst it is not, they don't know what they are doing. How you can even trust such AV? You know if your AV does not find "anything" who is going to continue subscription? Please be more specific. The tool works only with x64 processes. I've add the most common data types and scans. I hope all of you understand that there are currently five different tools in the software where each tool is difficult or very difficult to code. I simply haven't had time/energy yet to include all features. Please bear in mind, I've developed the tool for about a year, CE being developed for 14 years? AFAIK this feature is unique to CTS. I am very interested to know did the IAT tool auto-detection logic worked with your game. CE being developed for 14 years? 18 if im not mistaken. Hi. I've updated the first post. There is a new version available. For those wondering, listed on his site the source code costs $299. I wanted to drop another opinion here because I think this is rather a joke. This tool is just a compilation of multiple tools put into one. I would not recommend anyone spending money on this because there is nothing unique or special about this tool that warrants the costs. It is compiled with tools/ideas taken from multiple projects, all of which are free and open source. It's great that yourself, and others that do similar to this, want to learn and make your own scanners etc. But when you are literally just piecing together other peoples work, copy pasting chunks of things, or only converting between another language to yours of choice, this doesn't constitute as you owning it to be able to sell it. What's wrong with implementing many tools into one? I've literally implemented each feature (my own codes/logic). The source code will back it up. And it's there for those who are "afraid" of obfuscated executable. I've literally implemented each feature. The tool is not a port of any other tool. Features in the software are advanced and literally difficult to implement. My C++ skill is a noob as well. I understand maybe 0.001% from Scylla's source. For example I never coded a line in Pascal. Can you tell us how I copy pasted or "compiled" therefore pointer scanner implementation from CE? You're basically saying that the tool is useless. But why I bothered with if that's the case? Also my memory viewer implementation is unique as well and my own work. I did not copy/pasted his source. Everyone who used my memory viewer should immediately understand my implementation must be be my own codes as there are nothing else available that even comes to close to it if we don't count ReClass. PS. I work on CTS source 6-12 hours/day. And you say I do not own my own code? Is this some kind of a joke? My points are not to discourage you or say your tool is trash. My point was the cost of the source code that was something myself and a handful of others laughed at because of what it involves. In the game hacking, cracking, reversing, etc. scenes it is super common practice to see something like your tool happen. It is a creation of various things that already exist, based on things that are already open source that generally do nothing new but just have multiple things in one. This is super common with Vb.Net / C# coders that remake things like injectors. They'll generally copy/paste a template, redo a few minor things, put their name on it and brand it as their own. The underlying code, regardless of what original language it was in is still the same and ultimately the rewrite is nothing more than a redesign of the original, adding nothing new to the mix. Looking at your tool, it feels like this to a handful of people that share the same opinion as I do from other sites. This tool is just a few tools put into one, with nothing different or unique brought to the table such as what I pointed out above with the 3 links to the other tools that do what yours does, already for free and open source. Just by porting code to another language and making your own UI doesn't mean you put in the effort and time to learn and make the actual underlying code, or understand what it means, how it works, what it does etc. Saying that you wrote this in C# and not the same language as the other tools, therefore its automatically yours is kind of the reason most things in these scenes never become open source anymore. The amount of copying and credit stealing causes people to not want to share things at all. I'm sure you took the time to make the tool in C#, I'm not saying you didn't. But I can pretty much guarantee that if you compare the src of your stuff to CE/ReClass/Scylla, its going to be extremely identical regardless of the different languages used just based on how your took works, what features it has and such. I'm not saying don't keep working on your tool and making something you enjoy. But what I am saying is charging for the src is more or less a total joke when the base concepts and core code you used to make your tool from are free already. It doesn't give you the right to charge for it. My purpose is not to offend you but I must ask. Are you envious? The time I've spent on the tool. That price is a theft. Go and work on a tool like this for over one year averagely 6 hours/day. Maybe you will then think other way. I haven't copy/pasted any template. I've pretty much coded the tool from the ground. The source code backs it up. Yes I've literally studied most of things. The tool like this cannot be just copy/pasted and coded like that. Where from I can download CE+ version because of the availability of the source code that has improved even one feature? Which template I copy/pasted for pointer scanner? I never coded a line with Pascal. I implemented those features myself. You should not mention about cracking games in same context with me and my tool as I got absolutely nothing to do with that. My tool is not a port of any other tool. I improved and added features that were missing from other tools. Is this some kind of joke? The tool is not a port of any existing tool. I don't even remember the total time for the tool but for sure at least 6 hours/day for one year. How this is possible? https://vimeo.com/286535013 If I did not put in the effort and time to learn and make the actual underlying code. I will ignore posts like this in the future. What's your whole point with your claims? A one liner please. I think the point is "Why would I pay anything for this when CE, x64dbg, and others are free and open source". You don't have time for the UI, but it takes up the most time (out of a year)? And the majority of a year on that UI, for real? 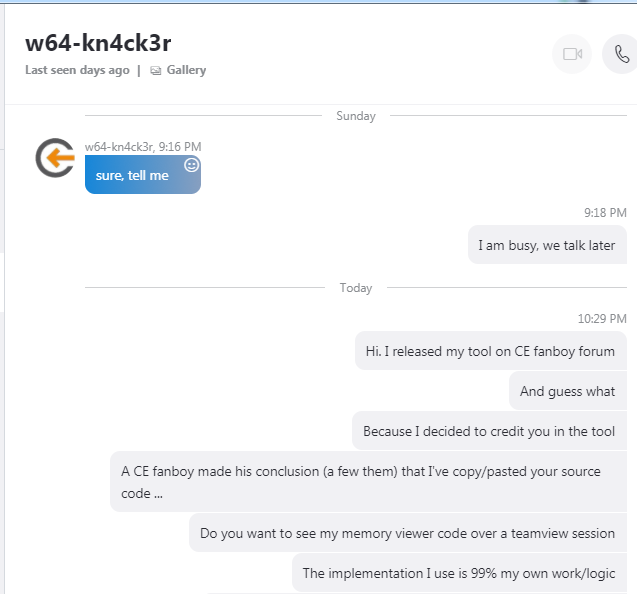 Not that I want to come down hard when others already seem to be doing so but claiming you wrote it all yourself is a bit disingenuous when you credit DB and KN4CK3R for their source code... rewriting pascal as C# (or whatever) doesn't necessarily make it yours regardless of how long it took to understand it. While making improvements or adding new features would be yours, they're probably a small part of the overall code, of course I'm not going to spend the money to check. Similarly with saying you haven't spent much time on the UI but then saying that it "almost takes the most of my time", 6 hours a day over a year = 2190 hours, most would be >50% or 1100 hours. On UI. That's, in your own words, "very basic". Though perhaps you're simply not fluent in English and meant that you've spent the least amount of time and thought on the UI not "the most"... who knows. Have someone's lost their mind with these claims? Is someone going to claim soon that ReClass.NET author did not wrote his code? I asked here a few years ago that could I get pointer paths in CE's pointer scanners copy/pasteable in plain text like they are in my tool. Only because I cannot code a line in Pascal nor I barely even understand it. None bothered to answer. CE's source has has been available for ages. Where is the list of releases that even improved a basic features like that? That's why there is almost equivalent pointer scanner in my tool. It is almost retarded to claim that working with an ancient IDE like Lazarus with Pascal source is more convenient than C#/VS2017. The hours I've spend on the tool are enormous.